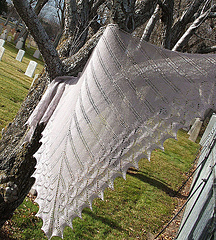 This shawl was originally published in Summer 2006 issue of Interweave Knits, then re-released through mimknits.com. 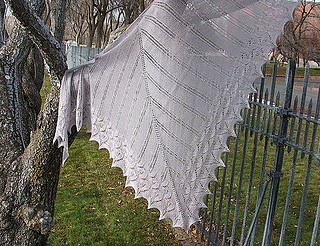 It is also included in the Best of Interweave Knits anthology. Please note that the yardage in both of Interweave's printed versions is underestimated for the average knitter. 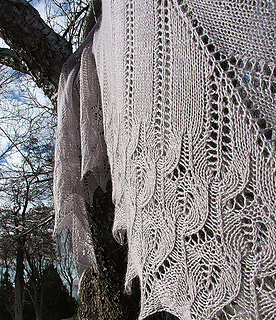 This shawl was inspired by a lace motif in Sophia Caulfeild’s Dictionary of Needlework, first published in 1882. The top-down construction allows the design to flow downward, giving the feeling of feathers dripping from a stick frame, just as in Greek mythology, Icarus’ feathers melted from their frame as he came too close to the sun. 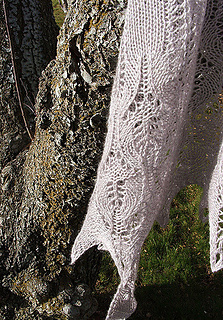 Because fit is not an issue, any yarn can be used and the pattern includes instructions on how to decrease or increase the pattern to get the desired size. Download also included French Language PDF. 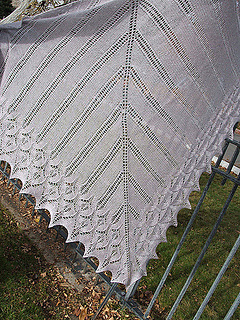 The French Language version of this pattern is a couple iterations behind in the layout department, but the pattern still works. Updating the layout is on my list of things to do when I have some free time (with about a million other such things), but I don’t know when I’ll be getting to it. For now though, if you’d prefer the French Version, it’s one of the pdf’s in the download. by The Alpaca Yarn Co.